For more than 40 years I have been immersed in high-profile businesses in disparate industries including broadcasting, publishing, motion picture production, cable television, real estate and banking. My business life is characterized by start-ups and turn-arounds, endeavors for which I, along with many others of my era, was ill-prepared. Mistakes were made – lessons learned – lessons I never learned in school. Blunders should be expected and then milked for all the lessons they can provide. The best entrepreneurs see dumb moments as inevitable and as an exciting aspect of the wonderful game we play called business. 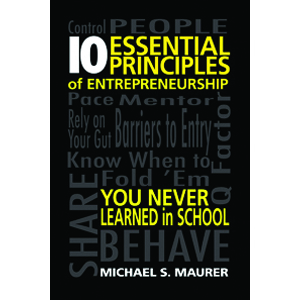 From my mistakes, I developed principles that when properly considered and applied will protect you from foolish propensities, guide you to create the proper business relationships that make success a higher probability and prompt you to practice entrepreneurism at a lofty level. It is my hope that this treatise will provide entrepreneurs with savvy, street smarts, and wisdom.